A 3-4 defensive formation has certain requirements of its linemen. Size and strength head the pack of those necessities. Speed doesn’t hurt, either. Linval Joseph has all of the above. The East Carolina junior – all 6-foot-4, 328 pounds of him – ran a 5.1-second 40-yard dash and bench pressed 225 pounds 39 times at the NFL combine (see video here). Joseph talked about his flexibility along the defensive line as well as his determination to improve his combine numbers at ECU’s pro day March 25. I wanted to talk to you about your decision to declare early for the draft and how you’re feeling about it so far. Oh, I feel good about it. I feel I accomplished my goals at ECU, and I’m ready to make a step to the next level. And right now, everything’s going pretty good, I think. Were you satisfied with your combine? No. I mean, I think I did okay, but I could have done better. Hopefully on the 25th, I can make up for some of the stuff I did bad in at the combine. So, your pro day is coming up. What are some of the areas that you want to try to improve? I want to run the 40 over again. I want to get under a five (-second time). I want to do my broad jump, stuff like that, and just make sure each event counts. Do a lot of field stuff, show them I can move side-to-side, and that I’m explosive and fast. Now, a lot of teams are switching to a 3-4. You guys played a 4-3 in college, right? Yes, sir. We played a little bit of both. Mostly 4-3, but we played 3-4 on occasion. With certain teams that seemed like they passed a lot, we’d go down to a 3-4. 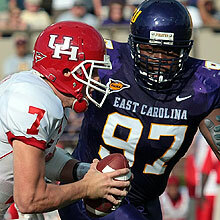 I’m going to ask you the same question that I asked (former ECU teammate) Khalif Mitchell last year. What do you see as the biggest differences in playing a 3-4 or a 4-3? Oh, 3-4 basically, for me, I might be playing inside, basically being triple-teamed. In a 4-3, you get double-teamed instead of triple-teamed. Definitely, you have to be heavier to be in the middle playing a 3-4. In a 4-3, you have a little more – a little more freedom, I guess. Have you been speaking to NFL teams at all? I’ve spoken to a couple of them. Do you want to say who? All right. Fair enough. (Laughs.) Has there been any talk about you playing on the outside – maybe playing a defensive end in a 3-4? Yeah. We’re talking about a 3-4, I’d be playing a five technique. So I guess I’d be defensive end, that kind of thing. So, yeah. And how would you (feel playing) a five technique as opposed to other techniques? I’d be okay with it. I really would. You know, I’m not totally all the way on the edge, but I think I’m athletic enough to do that, to play both positions, inside and out. I’ve lost some weight, and I could do it. Do you think you’d have to slim down for that? Do you think if you played in the middle, you’d have to bulk up? My playing weight is just over 315… I’m only about five pounds away from that right now, so I could play that (defensive end) position. So you’re at 320 now? And what is a five technique, for someone who doesn’t know? It’s almost – it’s like a defensive end, but instead of you’re outside shade of the tight end, you’re inside shade of the tight end. And basically, you want to hit the tackle and close the pocket, and keep the edge. I see. What have you been doing to lose weight? What type of workouts have you been doing? I can’t say eating less, but eating healthier, and doing a little more extra cardio. Was there really a restriction on your diet in college? No, not really. In college, when I first got there, no. And then… after my freshman year, I just told myself, and made myself – I knew what I had to do, you know what I mean? So I just ate better, and I brought my body back. How much did you weigh when you were a freshman? I came in at 335, and I got out (that year) at 301. At one point, didn’t you hurt your back playing? No, I didn’t hurt my back playing. It was offseason, and my leg went numb. I couldn’t figure out what was going on, so I went to the doctor here. That’s when I had X-rays, MRIs, and I had a bulging disk. They said my disk was on my nerves, and that’s what was making my leg go numb. Wow. So, were you out of commission for a while? Oh, no. I was out three months over the summertime. I came back in August, and I played in a scrimmage, then the first game. Never missed a game. Wow. You’re from Gainesville, Florida, so what schools were you looking at besides East Carolina? Along with East Carolina, I was looking to go to the University of Florida, Georgia, Auburn, LSU. (Those were the) top schools I was looking at. What made ECU your first choice? My first choice was Florida, but they told me they had what they wanted, and they told me to look for another school. And East Carolina gave me a chance, so I went for a visit. I liked it, my mom liked it, and that’s the best decision I ever made. What were some things – in terms of the campus, what were some of your favorite things about it? East Carolina? Not too big, not too small. It’s a very hands-on school, so I really liked that a lot. And I had an opportunity to play as a freshman and accomplish a lot of goals at ECU, so that’s why I signed on at ECU. Now, where were you born? I was born in the Virgin Islands – U.S. Virgin Islands. And when did you come to the United States? Oh, it’s part of the United States. (Laughs.) But I came to Florida when I was two years old. I’m sorry. That was a dumb question by me. So when did you come to the Continental United States, I should have asked? I came when I was two years old. Okay. So it’s not like there’s been a big transition or anything. You’ve always played football. Yeah, that’s kind of true. But… I grew up an athlete. I played everything: basketball, football, baseball, soccer. I just liked sports. I liked winning. I got introduced to football, and I just liked it ever since. I first started playing – oh, I can’t remember how old I was. I think I was 14, 13? I went to a Florida club one year. I wanted to try it out. They put me in a group with the 15-year-old boys, and I held my own. Ever since then, I liked it. Did you finally decide on football just because of your size? What made football better for you than other sports? Really, track (and field) was my first sport. Like, that was my first love. I was good at football and track, but I liked football more because it was just more fun to me. I mean, I did a lot more in football than I did in track. In track, I’d just throw shotput and disc, but football, I played running back, tight end. I played offensive tackle, defensive tackle, defensive end. I played a whole bunch of positions in football, so I liked that a little bit more. Was there ever any consideration of maybe participating in track and field in college? Yeah, I did my freshman year. But there was a lot of stress on me. I got really tired, so I just stuck with football. How are things looking for your pro day? Are you feeling pretty confident? Yes, sir. I feel real good. I’ve lost some weight. I feel like I can run under a five (-second 40) and I’m just ready – I’m just ready to make a big impression. What do you think scouts should know about you that they might not know from watching you on film or seeing – from being at the combine? That I’m going to work hard and I’m going to never give up. And I’m going to show that on Thursday… On Thursday, I’m going to go hard. I’m going to give it all I have, just like I never went to the combine. I’m just going to give it all I have. Excellent. Well, good luck, Linval. I really appreciate your time today. Email Chris Warner at chris.warner@patriotsdaily.com.